A charming and entertaining RPG based around a fun concept. It may lack variety and staying power, but you'll enjoy your time in its colourful, pixellated universe. A smart metagame makes this more than just a publicity stunt. Teamwork powers add clever novelty to grid-based combat. Shallow mecha finales are a colossal waste of potential. even by sentai (/our) standards. We haven’t played a game this cheerfully meta since we developed Game Dev Story in Game Dev Story. 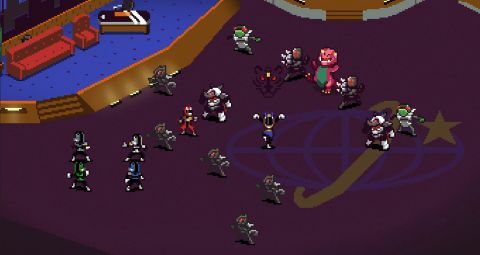 Yes, in screenshots Behold Studios’ super sentai-in may look like ‘merely’ a game about turn-based battling with knock-off Power Rangers, but it actually casts you in the musty costumes of five skint stunt actors filming a knock-off of Power Rangers. This mightily morphs how the game plays out on a number of levels. Take the combat: true to the show’s formula, you’ll spend most episodes in fisticuffs with spandex-clad goons and colourfully costumed bosses, then take to a stocky mecha to punch the monster of the week out for good. The twist is that you’ll have to please your audience too. Flashy moves and teamwork earn fans, as does nailing the director’s objectives for each scene; put on a good show and you’ll earn enough merch money to keep the lights on and the cameras rolling. Between episodes, however, you also have a studio to run. That means everything from answering fan mail to hiring agencies to sell your toys. Impress viewers and the group’s money troubles end around season three, however, though by this point you’ll have realised that the game’s more important economy is the crafting materials that fall from defeated minions. All it takes is a little cardboard and silver tape and you’ve got a powerful new punching arm for your giant robot. It’s a satisfying accompaniment to the light, bubbly on-set strategising and cheeseball storyline. You could read that as a negative, but both are enjoyable to watch play out, and have their smarter moments. The plot arc, for instance, touches on how fame changes the group, as well as lampooning several genre tropes. Plus while your team’s growing collection of active and passive abilities offers a bit less nuance than you might expect, the ability to enter a teamwork state that can hoist other rangers into attack position, as well as join forces to gang up on an adjacent enemy, is a delightful touch in a game where so much is on loan from the props department of other media. The problem, however, with emulating a show built to formula is that things inevitably end up a little repetitious. The scenery shifts and the cues change, but that only goes so far across season after season of battling samey legions of red-eyed putty stand-ins. Mech fights, meanwhile, rapidly feel insubstantial; a simple try-your-luck combo system for hits and timing minigame for defence saved only from flimsiness by a few flashy special abilities. And while the script pokes fun at the intentionally terrible grammar of the narrator, there are enough genuine typos throughout to make the joke backfire. But Chroma Squad was never intended to be taken too seriously or binge-watched, and most of these issues fade with adequate screen breaks. What’s more important is that Behold’s game is no poser, but rather a guilty pleasure that does more than just trade on its multi-coloured touchstones. It may never be zord – sorry, lord – of the turn-based strategy genre, but its easy-going charm should win it plenty of fans. Description A JRPG-style game where you control a team of actors portraying characters inspired by the Mighty Morphin' Power Rangers. It's as silly as it sounds, but nonetheless fun and entertaining.